Available in sizes 36" to 190"
We have over 100 years of experience in one award winning team. 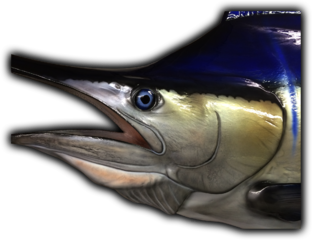 Let our marine taxidermists work closely with you to create the Blue Marlin mount of a lifetime. Blue Marlin are found in tropical and subtropical waters of the Atlantic, Indian, and Pacific Oceans. Female Blue Marlin can grow up to four times the weight of the Male Blue Marlin. Maximum weight of the Blue Marlin can be 1800 lbs. and length up to 17 feet. 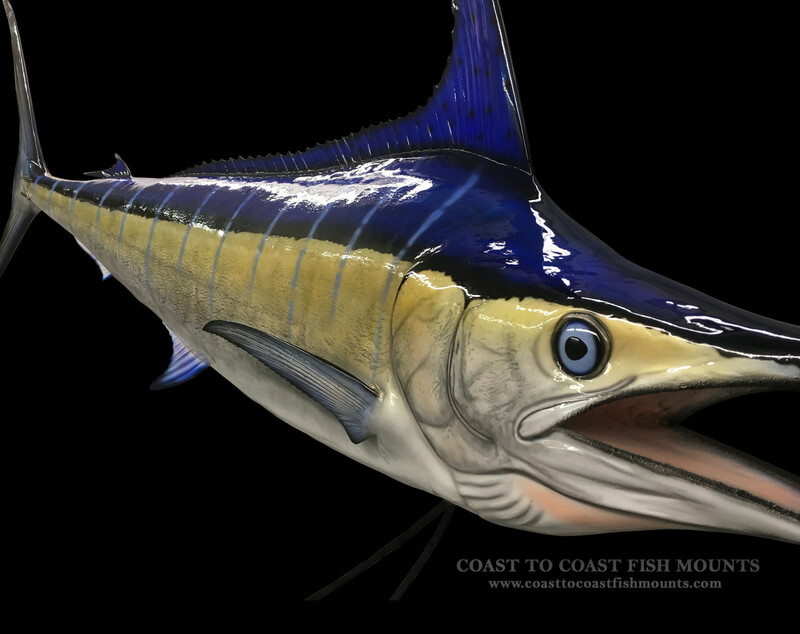 Our Blue Marlin fish mounts are museum quality art pieces that look like LIVE FISH. The finest materials combined with highly skilled workmanship that will last a lifetime without discoloring or ageing. 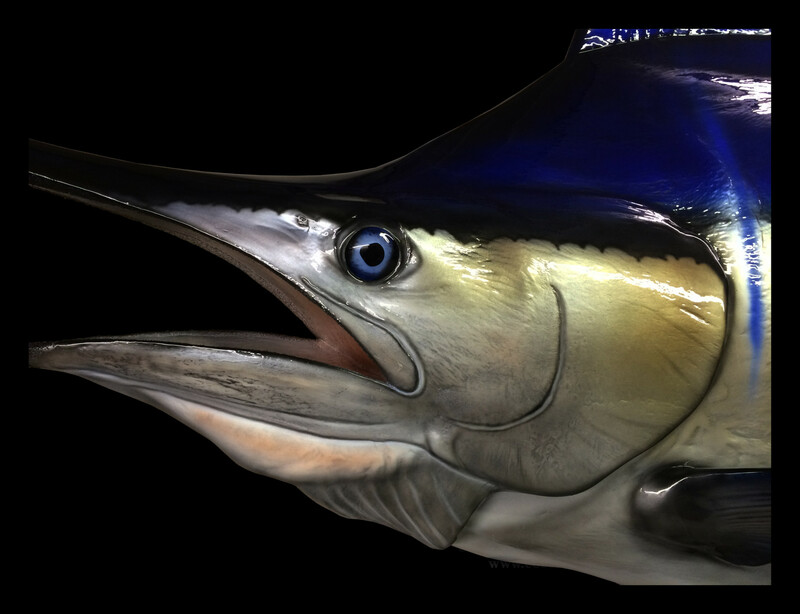 Striking anatomical posing as well as color accuracy holds the key to a meaningful Blue Marlin fish replica. 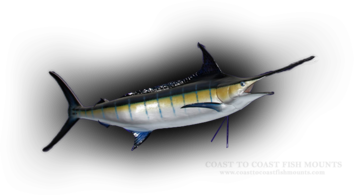 At Coast To Coast Fish Mounts, we capture the power and gracefulness of the leaping Blue Marlin in all of our Blue Marlin replica fish mounts. 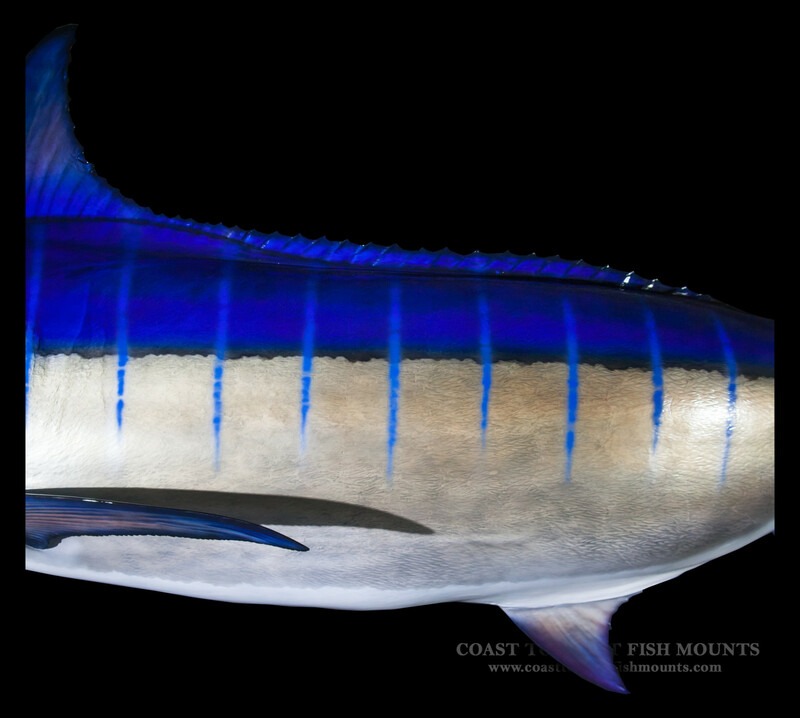 Blue Marlin can display many different color patterns. We have the knowledge and capability to match the colors of YOUR FISH. With or without a photo we will work close with you to custom paint your fish replica to match your fish exactly! Custom blended translusive lacquer paints and the finest clear urethane topcoats are always standard at Coast to Coast Fish Mounts. 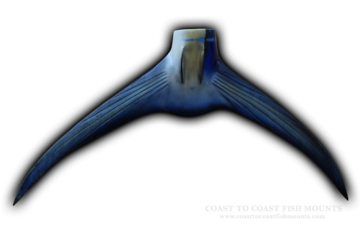 Our Blue Marlin fish replicas are available in customer pleasing high action anatomical poses, as in traditional slight bend to the head, slight bend to the tail, swimming pose, leaping pose, tail walkers, and rolling down poses. Open mouth, open gill, and complete mouth detail is standard. Available in sizes 36 to 190 inches. 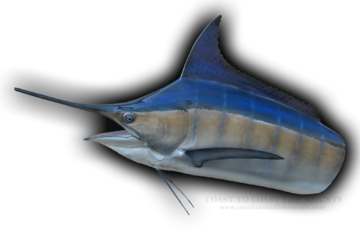 Location & Habitat: The Blue marlin is found primarily in the tropical regions of the Atlantic Ocean. The Blue marlin prefer the Northern and Southern Hemispheres during the warm month and follow the seasonal water temperature changes towards the Equator during the colder months. Blue marlin are found in ocean waters great distances from the continents as well as coastal regions near deep waters, such as near the Mississippi River in the Gulf of Mexico. 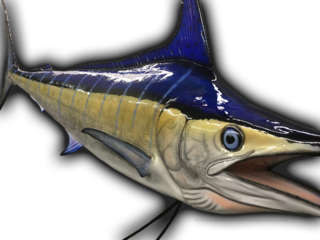 Biology: The Blue marlin is the largest of the billfish. Female blue marlin can grow up to four time the weight of the male. Blue marlin have 2 dorsal fins; the first dorsal fin, consists of 39-43 “rays” while the second is small and consists of 6-7 “rays”. The Blue marlin is a powerful swimmer of great speed and stamina. Grooves for the pelvic fins improve hydrodynamics. The bill on the blue marlin is long and both the jaws and roof of the mouth are covered with small, file-like teeth. Physical Description: Female blue marlin specimens have been reported to weigh 1,200 lbs to 1,800+ lbs. 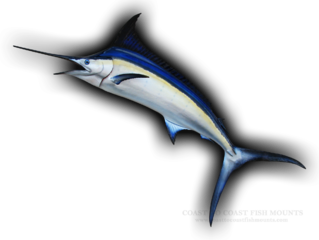 The body of most blue marlin is a black/blue top with a silvery white underside. The blue marlin have approximately 15 pale blue colored stipes on both sides which consist of a round dot and line pattern. The Blue marlin has very few predators with the largest one being the great white shark. Blue marlin reach maturity between 2 -4 years of age. The female blue marlin can spawn as many as four time in a season and can release over seven million eggs at once. Female blue marlin can live up to 27 years while the male blue marlin live for about 18 years. 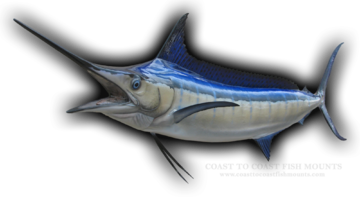 At Coast To Coast Fish Mounts, we will capture, forever, not only the gracefulness of the leaping blue marlin, but also the display of strength and fighting power that the blue marlin are known for when creating your blue marlin replica fish mount.